2011 horror movie starring Patrick Wilson. Shortly after moving, a family discovers that dark spirits have possessed their home and that their son has inexplicably fallen into a coma. Trying to escape the haunting and save their son, they move again only to discover that it was not their house that was haunted. 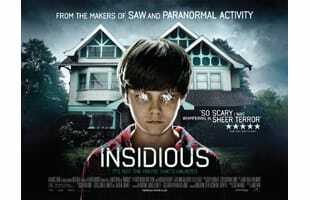 Get Ready For "Insidious: Chapter 3"
Rose Byrne And Patrick Wilson Will Return For "Insidious Chapter 2"
House Calls: Old School Horror Gets Modernized Greatly In "Insidious"
Special Preview of "Insidious" Tonight (3/29) in 25 Cities Across the U.S.